The delicate filly, so tiny people say she looks like she was ‘shrunk in the dryer,’ had a laundry list of problems when Ted Mielcarz met her. Just healing from a left tendon tear, the horse named Annie locked a stifle three weeks after embarking on light training. So when Mielcarz got the call from the barn at 9 p.m. in late October last year, he started having second thoughts about adopting the horse at all. “But she was so pretty,” he says. He drove to the Berlin, Mass. farm against his better judgment —“I was reluctant to go because I already knew I liked her.” He had to see how the horse was faring, and when he arrived, learned the news was not so bad. Veterinary testing confirmed that there was no lasting injury to her stifle, and after some rest, she would be fine. Things were looking up for little Annie. Until they weren’t. Well after her recovery last winter, Mielcarz was out hand walking the filly when she slipped on an ice patch, and fell on her side. “It seemed to happen in slow motion,” he says, recalling that just before she regained her footing, she looked at him with her big, beautiful eyes. He made his decision right there on that icy hill. Annie, now known as Willow, went home with Mielcarz on Feb. 1, but more trouble soon followed. About a month later, after the region experienced soaking rains that caused mucky conditions in her paddock, the filly developed [laminitis], requiring seven weeks of rest, and for a time, Mielcarz’s round-the-clock care. Finally, he was rewarded for his efforts when subsequent medical exams revealed that she was fully healed, and that no coffin bone issues resulted. “She healed perfectly,” he says, noting that radiographs were normal. 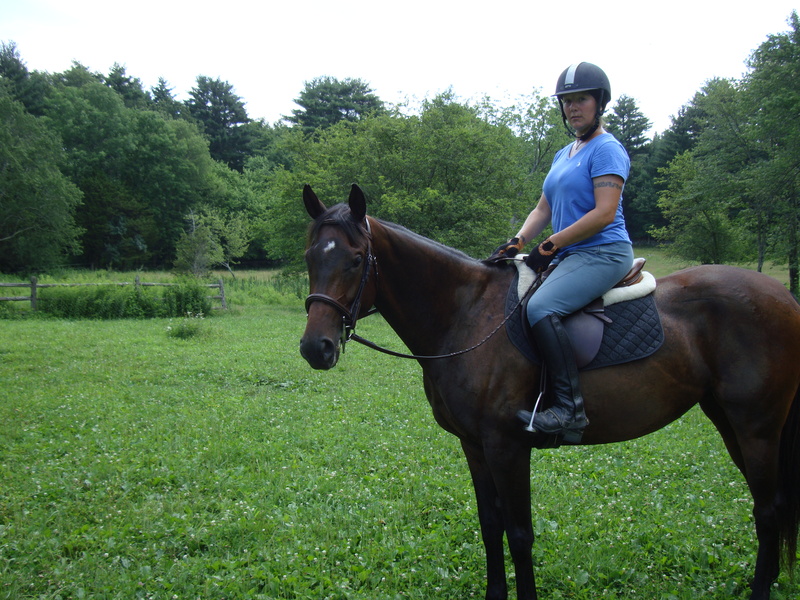 Mielcarz, a Boston area real estate agent and contractor, started looking for a project horse on the CANTER New England Trainer Listings last year. 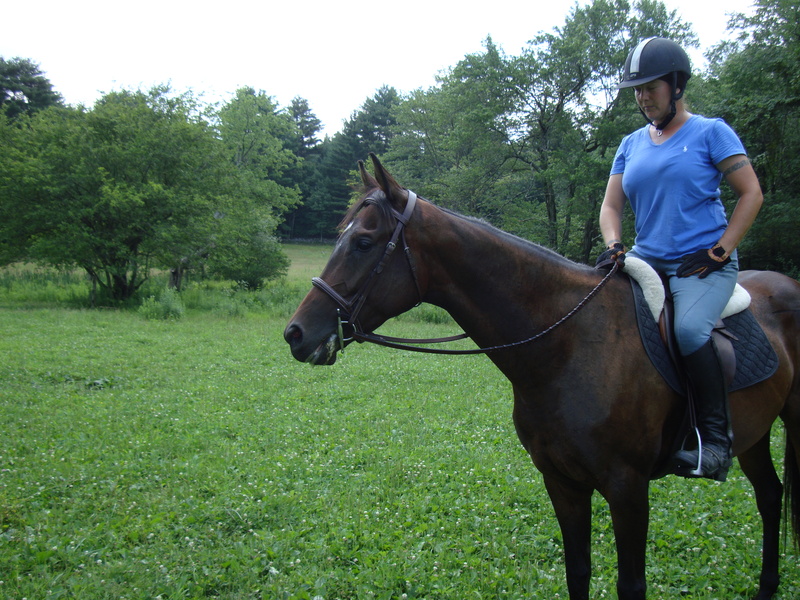 He previously had great success transitioning another off-track Thoroughbred into a hunter/jumper, and was looking for another prospect when he read the description of Annie’s small size and sweet disposition on a trainer listing. This spring and summer has brought good news: “She’s doing perfect. Her stifles haven’t locked. The trainer says she’s back into work. 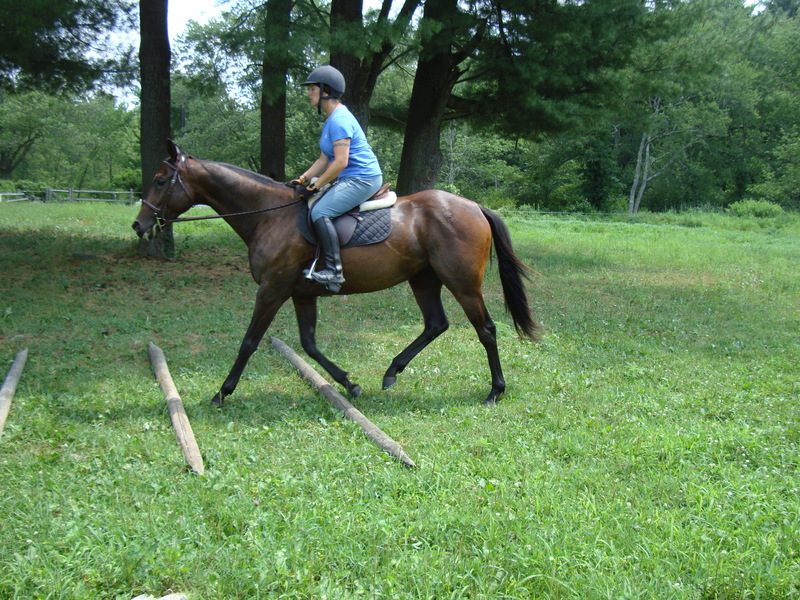 She’s trotting and getting strong,” he says. Although he doesn’t ride that much himself anymore, Mielcarz admires the old bloodlines of Thoroughbreds in a similar way he loves old bones of great houses. Ted’s hoping to find someone tiny to ride her. Hmmm. These pictures don’t do her justice, but I’m expecting some better ones soon. Meantime, it’s so great that someone who rarely rides himself is so committed to helping her. I’m so glad to see how well she’s doing, despite all those setbacks! I saw her in her stall at Suffolk last year, and fell in love – I wish Ted the best of luck with her! !